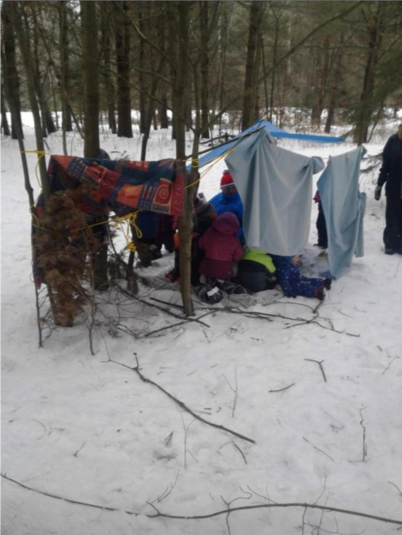 Here at Compass ELC Minden, we advocate for outdoor play! 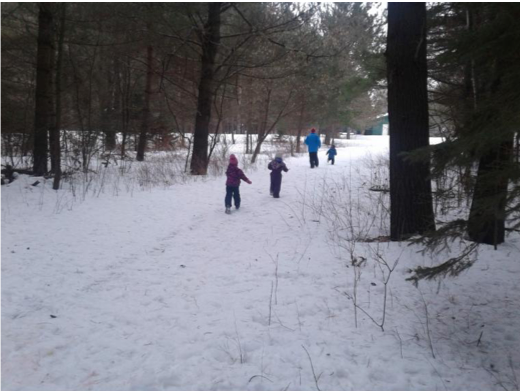 We believe that children should be out in nature as much as they possibly can. 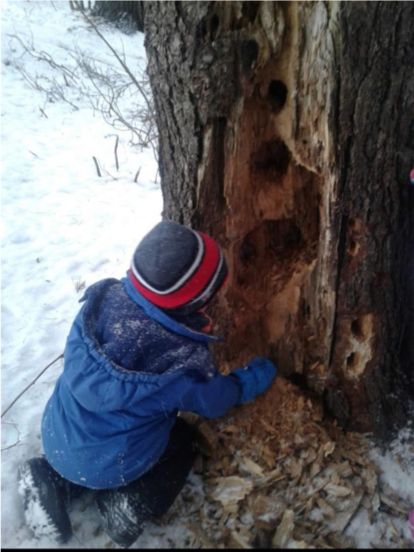 We are very lucky to live in such a beautiful area with nature all around us. The yard at our centre is well-known and anyone who visits always comments on our outdoor space. It has lots of space, natural dips and divots, sand, grass and is surrounded by beautiful pine trees that offer shade in the summer time. If that doesn’t sound beautiful enough, we also back onto a large field that we use year-round, which attaches to the most beautiful and magical forest. 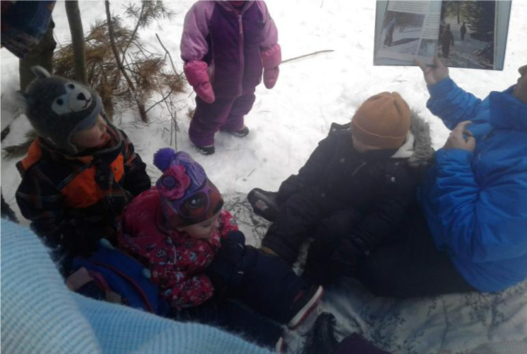 Excitement fills the daycare whenever there is talk about “going to the forest,” for both the children and educators. 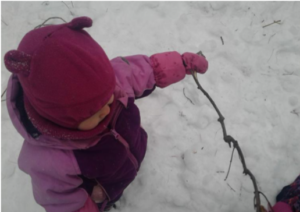 It is always an exciting adventure. 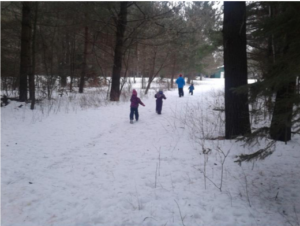 Our latest trip to the forest was one that we will never forget, and one that we talk of often. 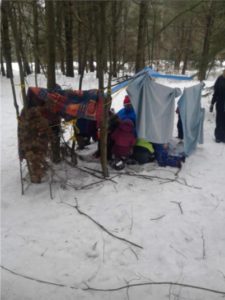 We decided that we were going to invite the entire centre, pack a lunch, bring shelter building supplies and other activities and spend the whole morning in the forest (in our special spot). The educators all collaborated and came up with a few activities that we could do in the forest with the children. 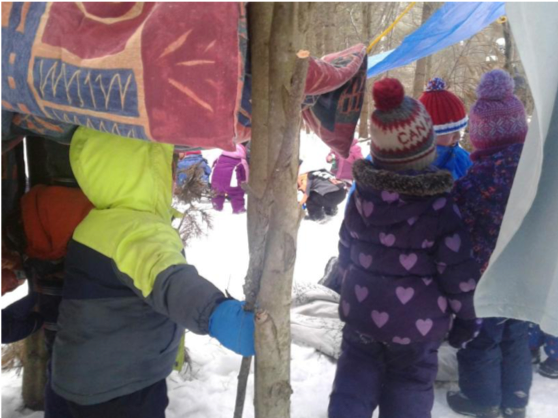 Once we arrived in the forest with children, toboggans and lunch in tow, we told all of the children that we were going to make a shelter to have our lunch in. 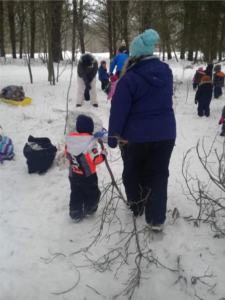 The children immediately set out to find branches, twigs and other materials we could use for our shelter. Once it was complete, we set up some activities such as spray bottle painting, feeding wildlife, and of course, just exploring the forest. 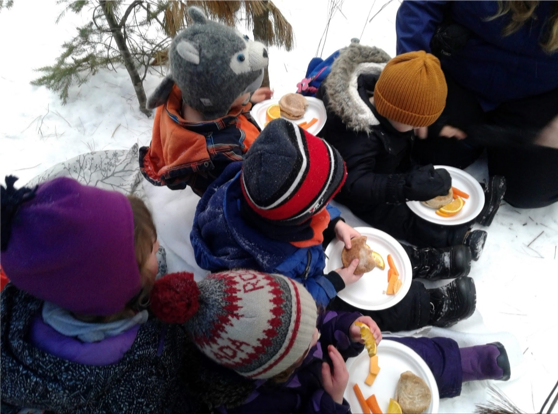 Just before lunch time one of our educators, Kinga, sat down with the children and read them a story called “Lets Discover the Winter Woods.” Lunch was served in the shelter where everyone enjoyed a delicious meal and warm drink together. After lunch we headed back to the daycare for a much-needed nap and to dream about our morning adventure in the forest.